Black tea is produced in the same way as green tea with a few exceptions. During the rolling process the membranes of the leaves are broken, allowing the leaves to oxidize (ferment) giving them their dark color. To stop oxidation, the leaves are then fired, preserving the desired flavor and aroma. Black tea does have some medicinal qualities, though not as wide ranging and powerful as those of green tea. The catechins in the green tea are oxidized into theaflavins and thearubigens during fermentation. These new compounds are still considered strong antioxidants. One cup of black tea contains approximately 5-10 mg. EGCg., and approximately 50 milligrams of caffeine. Coffee contains anywhere from 100-200 per serving. Assam is a black tea named after the region of its production, Assam, India. 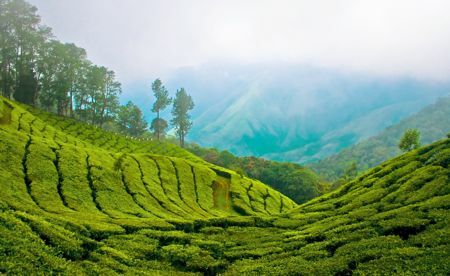 Assam is the world's largest tea-growing region, lying on either side of the Brahmaputra River, and bordering Bangladesh and Burma (Myanmar). this part of India experiences high precipitation; during the monsoon period as much as 10 to 12 inches of rain per day. the daytime temperature rises to about 103F, creating greenhouse-like conditions of extreme humidity and heat. this tropical climate contributes to Assam's unique malty taste, a feature for which this tea is well known. Delicious straight or with cream and sweetener. Start the day right! An all-time English and American classic, this tea is typically a blend of black teas such as Assam, Ceylon, and Kenyan teas predominating, and Keemun sometimes included in more expensive blends. Accounts of its origins vary. Drinking a blend of black teas for breakfast is indeed a longstanding British custom. The practice of referring to such a blend as "English breakfast tea" appears to have originated not in England but America, as far back as Colonial times. Full-bodied and malty, perfect with cream and sweetener. Treat yourself. An exquisite take on a classic with the sweet earthiness of vanilla. Try it straight or with some cream and sweetener. One of the most famous and well known teas, Earl Grey's distinctive flavor and aroma are derived from the addition of oil extracted from the rind of the Bergamot orange, a fragrant citrus fruit native to southeast Asia and grown commercially in Italy. Earl Grey is named after the 2nd Earl Grey, British Prime Minister in the 1830s and author of the Reform Bill of 1832, who reputedly received a gift, probably a diplomatic perquisite, of tea flavored with bergamot. We hand-blend our own Earl Grey in small batches. The tea may smell and taste a bit strong at first but mellows out after a week or so. Warming, spicy, sensuous, silky smooth and exotic. Ceylon Black Tea, Ginger*, Cinnamon*, Cloves*, Cardamom*, Orange Peel*, Cocoa*, Colorado & India Grown Chilis, and a tiny pinch of Black Pepper*. We formulated this tea in 2012 and it has become one of our best sellers, and is a personal favorite of ours. Rich, full-bodied, flavorful, with hints of coffee, bavarian cream, and vanilla, this tea is perfect with sweetener and cream. This is a great replacement for coffee. Yorkshire Gold Tea flavored with all natural organic Kona Coffee, Bavarian Cream, and Vanilla Flavors. There is no actual coffee in this tea.